This is one of the more entertaining trolls that I have had to work on... he definitely has an attitude! 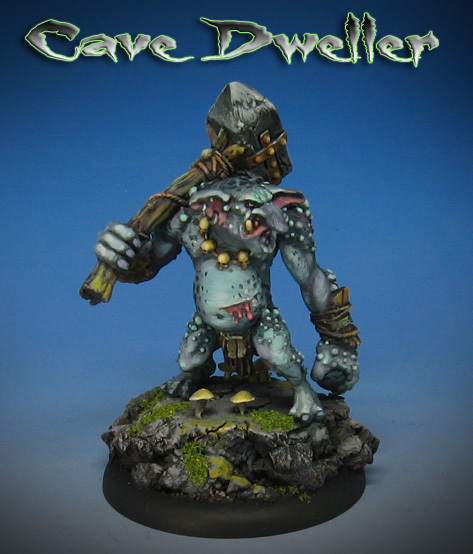 He had to be painted as a cave troll, to match a few others that were part of the group, which meant I had to get as much depth as I could with various grays. These were shifted cooler and warmer, with some purples and magenta being used as accent colors. I sculpted a few mushrooms for the base, which you can see a little better in the image on right. I also used the Vallejo Moss and Lichen environment medium, which was really interesting. That is the yellowish color on the mushrooms and on the stones surrounding it. That has a bit of a texture to it, and it really does look more "dimensional" than if I had just used some regular paint. I will be using this on some more figures which are part of this group, so I will try and do more of a step by step for you. Stay Tuned!